For my impending 35th Birthday hubby treated me to a meal at Smokehouse in Islington. I love meat and smoked meat is even better! We had a reservation for 6pm on a Saturday, just a short walk from Highbury & Islington station and we were promptly seated in an empty restaurant, evening sittings start from 6pm. This was amazing. 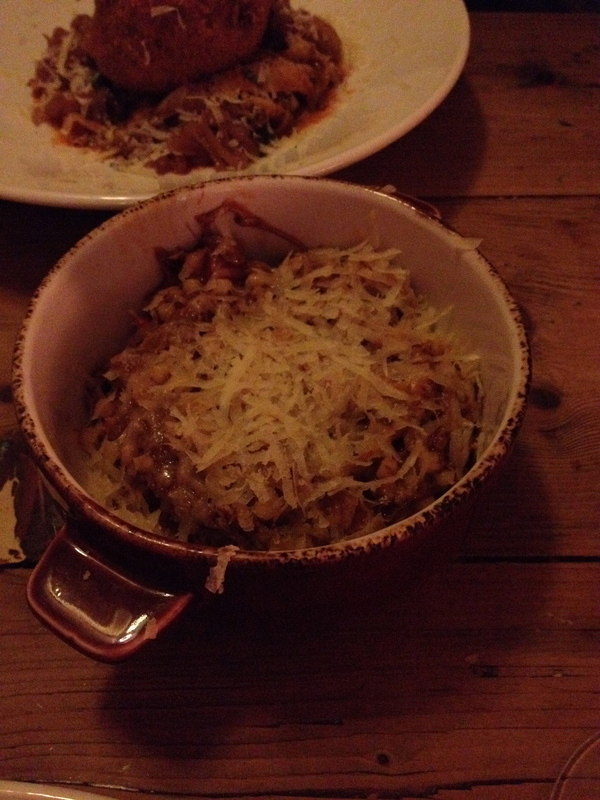 I got very giddy when it was placed in front of me as it looked like my second favourite food – croquette potatoes! Sorry, I know, but I can’t help it – I love them! 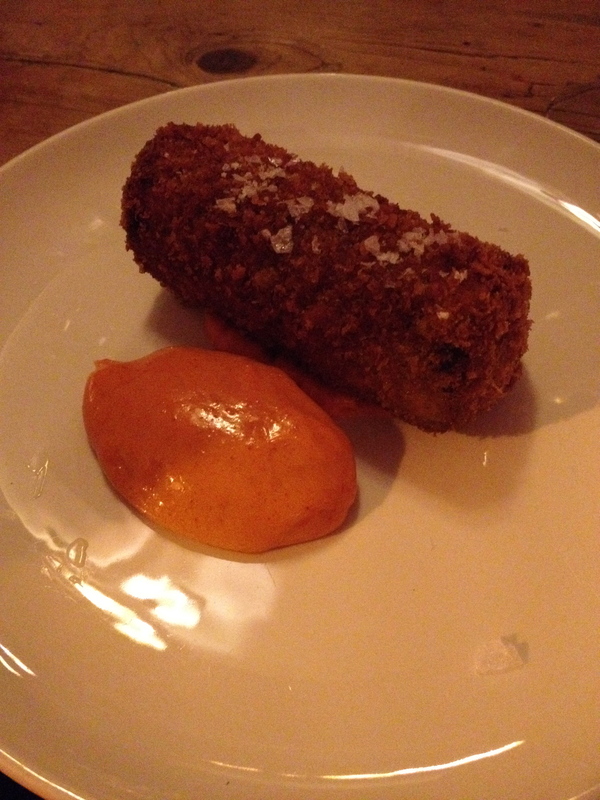 This was not a croquette potato, it was just a deep fried brisket roll, but it was delicious. Before I ordered I checked what gochujang was, and it is a spice Korean mayonnaise. It complimented the roll well, and was very tasty. I was reluctant to share this dish with hubby, but I knew I just had to try what he had. I only had a little taste of this, but it did include a duck heart. This was the first time I have ever tried one, it was a little chewy! The chicken liver pate was tasty but looked like it the dish would have benefitted from having more on the toast. Hubby & I chose these together to we could share half & half. 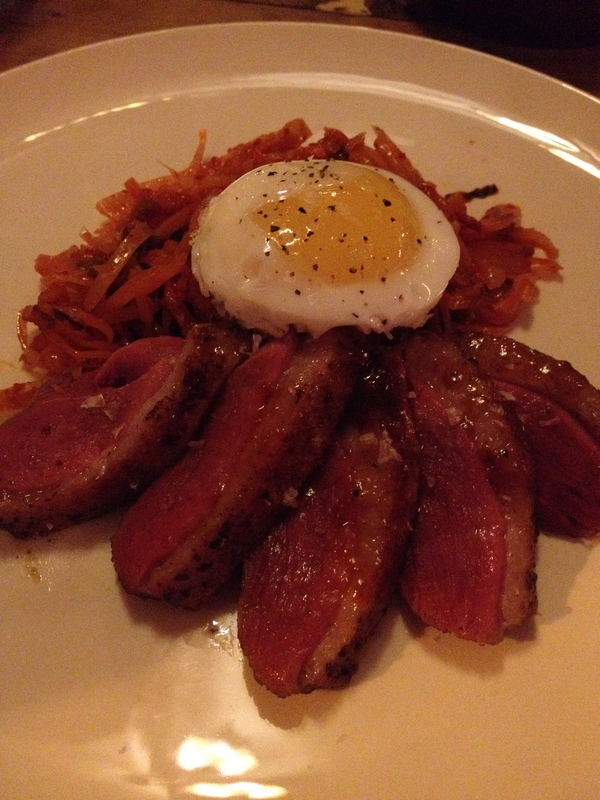 This was delicious, the duck looks like it is mainly cooked through the smoking process. (I was initially worried it was raw!). I had tried Kimchi when I was in China once, and this version was far superior giving the dish a nice little kick. The egg was a nice touch on the top. I was reluctant to share the other half of this. 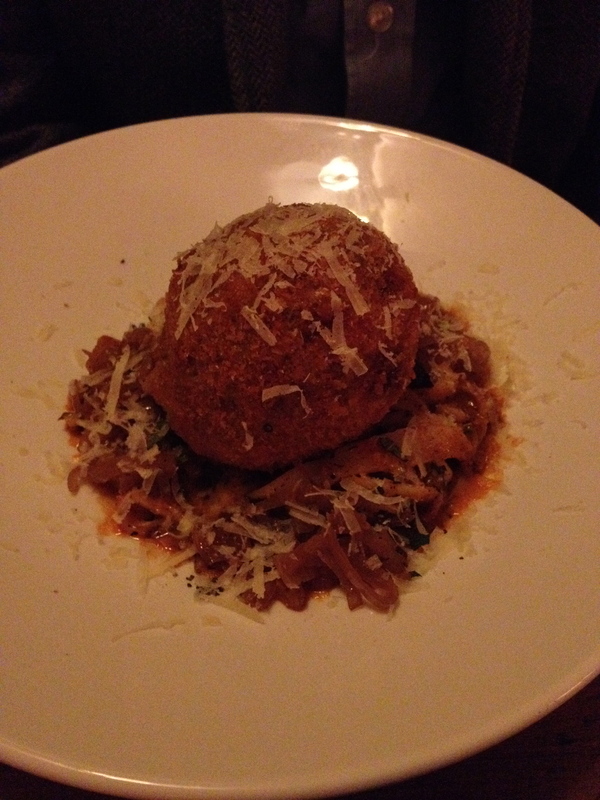 The Sphere looked like a giant arancini, it came on a bed of pasta, and was extremely tasty. By the time I moved onto my half I was getting stuffed. 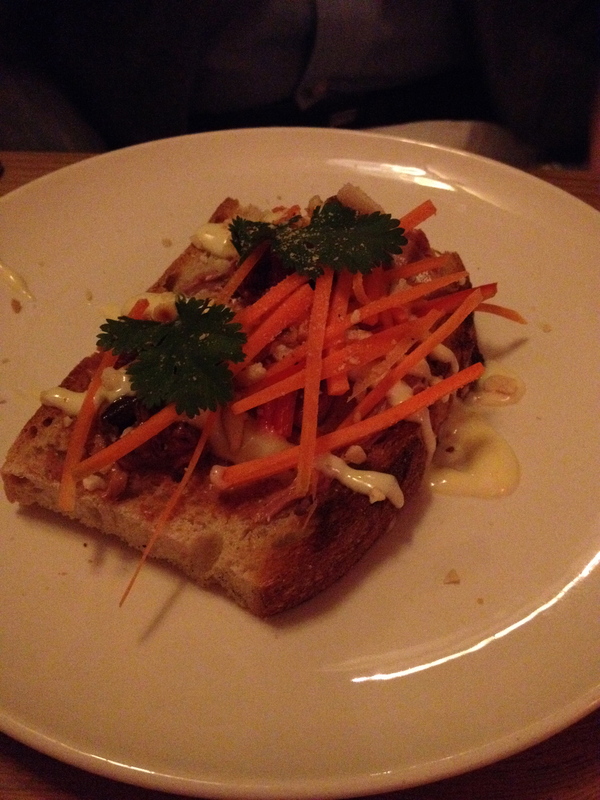 This dish was quite rich, and the smoked pig cheek lardons were to die for. This dish was recommended by our waitress and we heard a few of the other servers recommending to tables around us. I’d never had goat before, so was game to try it. However, I just had to try a desert! Similar to a Double Decker (but for legal reasons abbreviated to Double D) this had a rice crispie base, nougat middle, peanut butter(?) and a chocolate top. 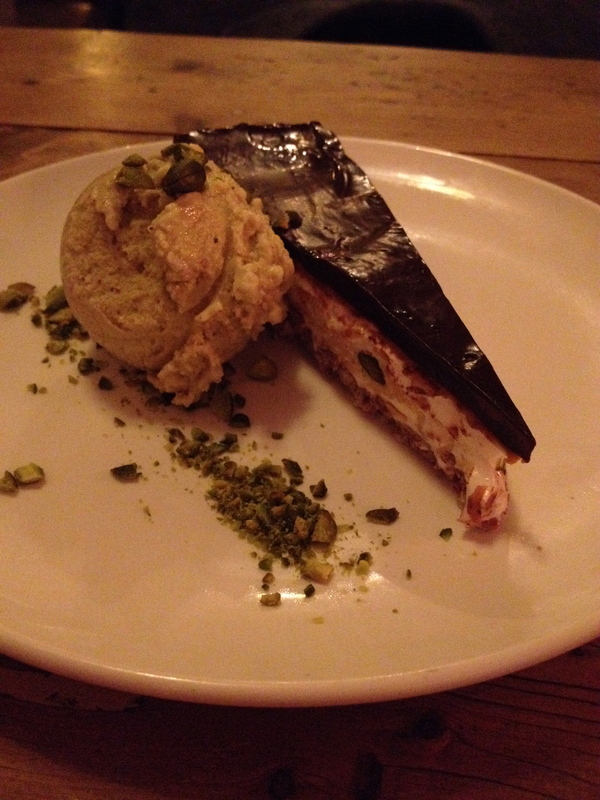 Accompanied by pistachio ice cream. I was a little disappointed with this as it didn’t really taste of anything, and was troublesome to get through the crispy base without catapulting a piece across the table. Hubby loves a good craft beer, so he sampled at least 3 different beers all served in 2/3 pints, including the Redhook Longhammer & Rogue Dead Guy Ale. He finished his evening with an aperitif of Express Coffee Liqueur, which he discovered was basically Tia Maria – oh how I laughed! 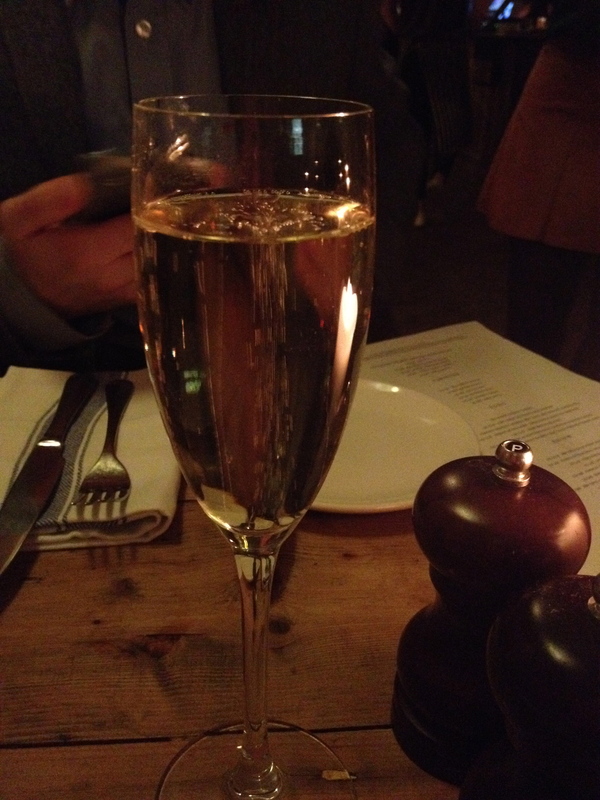 I had a couple of glasses of the Nyetimber Classic Cuvee 2008, which was lovely, and an Aperol Spritz. 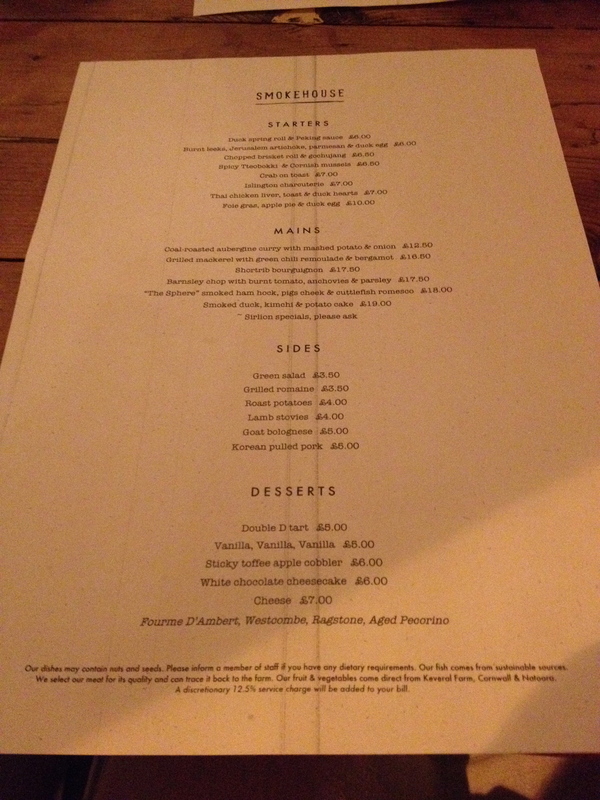 The meal for two came to around £120 including a 12.5% service charge. The staff were very friendly, knowledgable and helpful that I had no qualm with the level of the service charge. The restaurant is small and intimate and a nice atmosphere. It has a bar area, and with over 20 craft beers definitely worth a revisit for hubby to try a few more. Plenty of other dishes on the menu to try on a future visit too. Can’t wait!